The Honda Civic Si is back for 2019, with a $200 price hike and a major upgrade. No, that upgrade isn’t more power, and no, it isn’t all-wheel drive inspired by the top-of-the-line Ford Focus RS. The 2019 Si comes in snot gre—“Tonic Yellow Pearl,” because some automakers do care about keeping color alive. Oh, there’s also the “more intuitive steering wheel controls,” “physical buttons for fan speed,” “improved electronic parking brake switch” and some bigger cupholders. But the most important thing is that the car comes in a color other than silver, which we learned was added to the regular Civic lineup last month and which makes me fondly remember a time in daycare when we dyed cheese yellowy green and dipped pretzels through cardboard nostrils to eat it. See? Snot green is good, when it’s not actual snot we’re talking about. The Civic Si is the middle of the pack in Honda’s Civic lineup, above the regular Civic trims and below the direct Focus RS competitor, the Type R. It comes in a six-speed manual only, and for 2019, will keep its same turbocharged 1.5-liter four-cylinder engine with Honda’s VTEC and 205 horsepower. 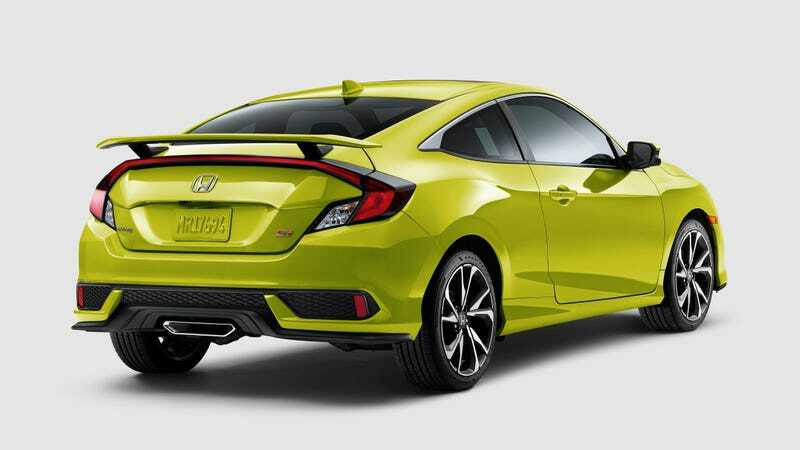 Just like on the regular Civic trims below it, the Civic Si will only get the option for a Tonic Yellow Pearl paint job on its two-door coupe models. (We have to differentiate between two-door coupes and four-door coupes in the automotive industry these days, you see.) Both the regular and Si sedans will also get a new, less cool color with a similar name: Platinum White Pearl. The Si press release didn’t say anything about the third pearl sister, Molten Lava Pearl, which will be a deeper red paint option on the regular trims of the 2019 Civic sedan. Oh, yep. That definitely looks like it’ll fit your oversized insulated cup filled with some sugary drink instead of something healthy like water, because people just don’t understand—you need that sugar jolt to get you through your day. But those cupholders also look like the perfect size for a big tin of cheesy dip, which we could drop some food coloring in to celebrate the virtues of snot green as a car color. That alone seems worth the extra cash.